Trump makes a vague threat to unnamed Democratic senator while defending Kavanaugh during a press conference. Trump was fielding questions from reporters about an FBI investigation into sexual-misconduct allegations when he said he supported Kavanaugh being interviewed. But he cast doubt on Senate Democrats’ apparent interest in the judge’s drinking habits in high school and college. Continuing, Trump said that if the allegations against Kavanaugh were really true, they would have come up “over the last 20, 30 years of his career. Later in the press conference, Trump was asked to elaborate on his remark by a reporter. “You just said some senators are not angels, and you’ve seen some of them in very compromising situations. Could you tell us who and exactly what situations you’ve seen them in?” the reporter asked. October 1, 2018, was your typical day for the Trump administration and its various hangers-on. Donald Trump bragged about a “historic” achievement—in this case, the “new” NAFTA agreement—while failing to mention that the pact, which he wrecked diplomatic relations with Canada to secure, is essentially a rebrand with some minor changes cribbed from Barack Obama. Sarah Huckabee Sanders ripped a reporter’s head off and used it for batting practice. Donald Trump Jr. proved once and for all that he’s a sentient bottle of Axe body spray. 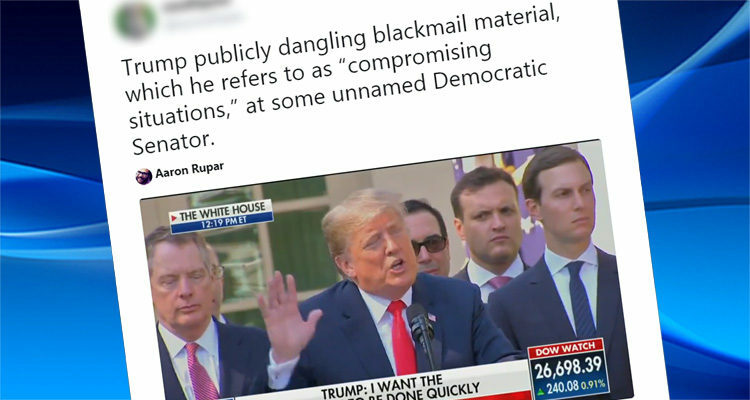 Oh, and the president of the United States suggested he has incriminating dirt on a U.S. senator that could be used for blackmail, if he so chooses. And in case you were wondering, yes, this all happened during the same press conference in which the president both insulted a female reporter, telling her, “I know you’re not thinking, you never do,” and accidentally admitted that anyone watching the Kavanaugh hearing came away with the impression that Tobin, P.J., and Squi’s buddy was a raging drunk, at least during his Georgetown Prep and Yale years. All in all, a red-letter day for POTUS!